I’ve got a real treat for you guys this evening! I’m actually headed out for Happy Hour with my friends Kate & Meg in a little while, and then we’re going over to the boys’ softball game tonight, so it might be a little bit later of an evening. Since I’m still not sure what’s planned for dinner, I didn’t want to leave all my favorite readers hangin’, so I have a little recipe to share with you all! These babies were probably one of the easiest but most flavorful cupcakes to make – they’re a MUST TRY. I had some suuuuuper ripe bananas to use up, and I found this recipe while perusing the Betty Crocker website, so I figured I’d give it a shot! The original recipe called for your standard water + vegetable oil + eggs, but I figured: why not make it a soda cake??? Heat over to 350 degrees. 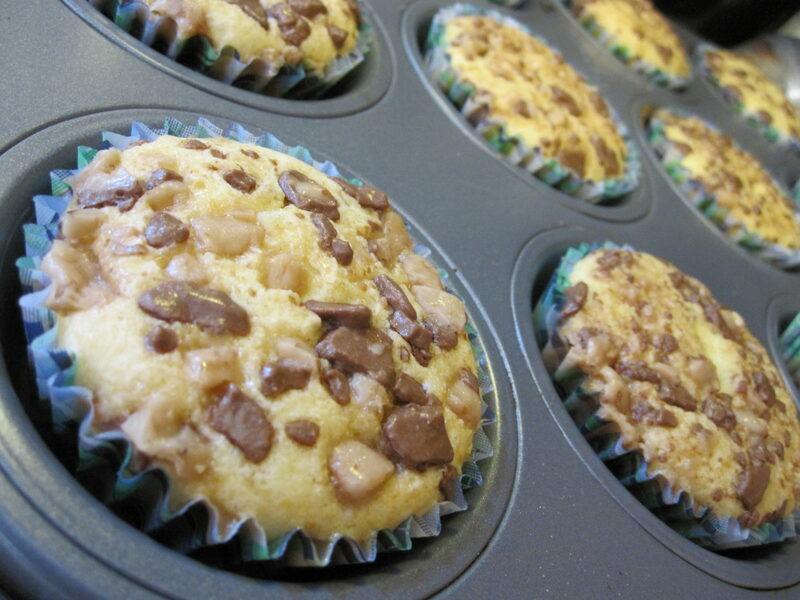 Line cupcake pan with liners, or spray with nonstick cooking spray. 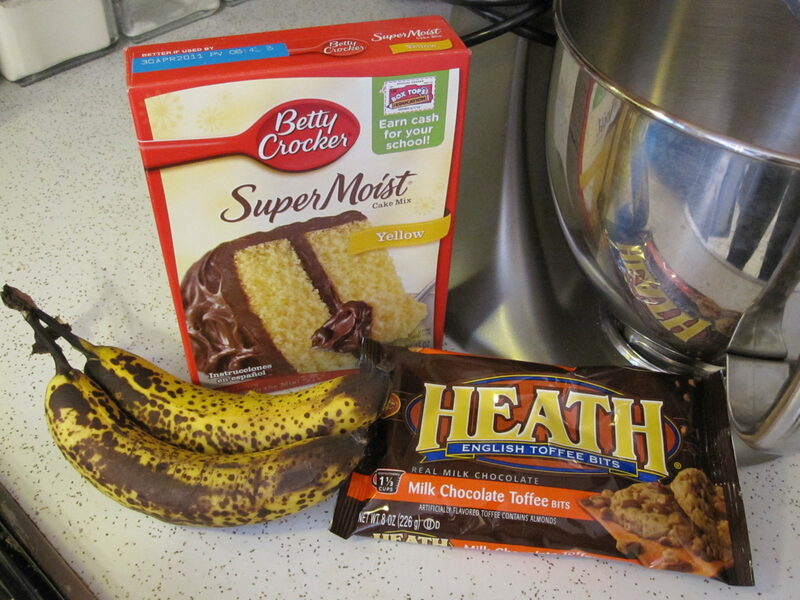 Beat cake mix, bananas, soda, and almond extract with electric mixer on low speed for 30 seconds. Beat on medium speed 2 minutes. 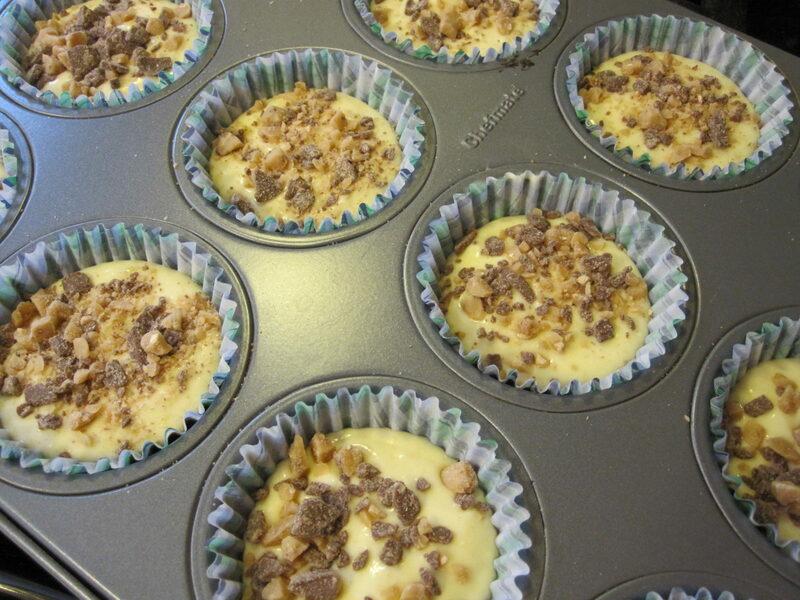 Fill cupcake liners 2/3 full with batter. 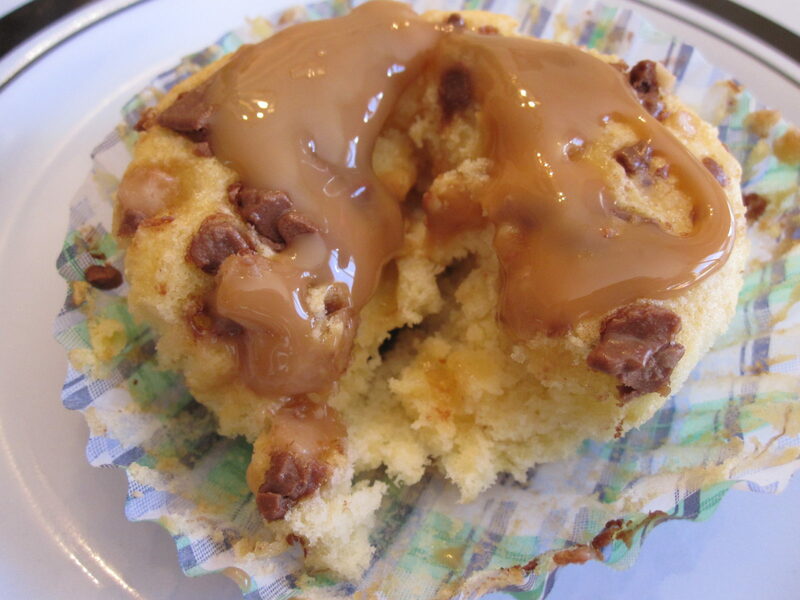 Sprinkle toffee bits evenly over each cupcake. Ahhhhhhhhhhhhhhhhhhhhhh! If I could jump through the computer screen, I would!!!!!!! Oh hello - YUM. I LOVE Heath toffee bars. Funny story, one of my dog's name happens to be Heath b/c the people who rescued him thought he looked like a Heath bar. Awesome! Okay I definitely want to try this for the 4th this weekend. I am not a chocolate cake lover so tell me what you think the best combination would be that isn't chocolate! Thanks! GREAT idea...although I am totally laughing that we are talking about this considering my post this afternoon, huh? HAHA...everything in moderation right? But I like that idea...yellow cake with Cherry 7-UP! YUM! Wow. These wouldn't last long at my house. YUM!!! 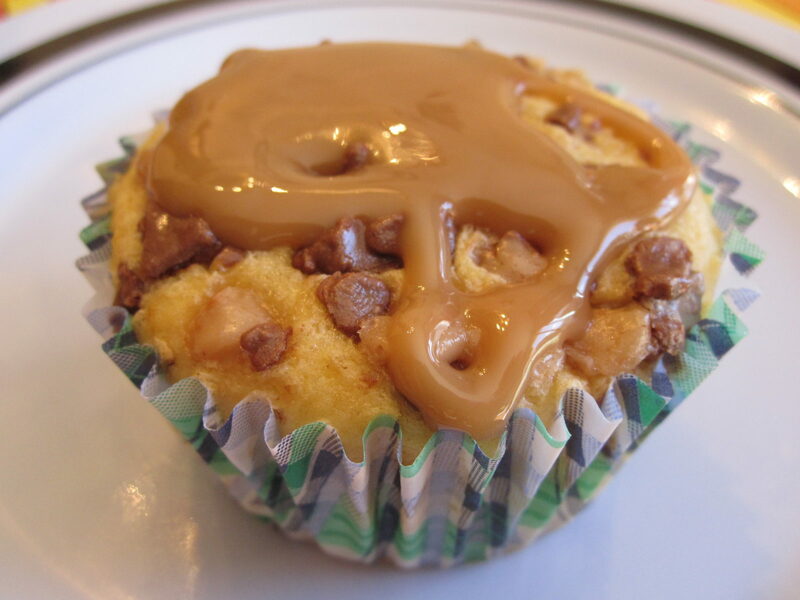 So I saw this recipe and it looks amazing, bananas and caramel is like one of my FAVORITE combos(: Okay, maybe a little too much emphasis but I'm so excited haha. 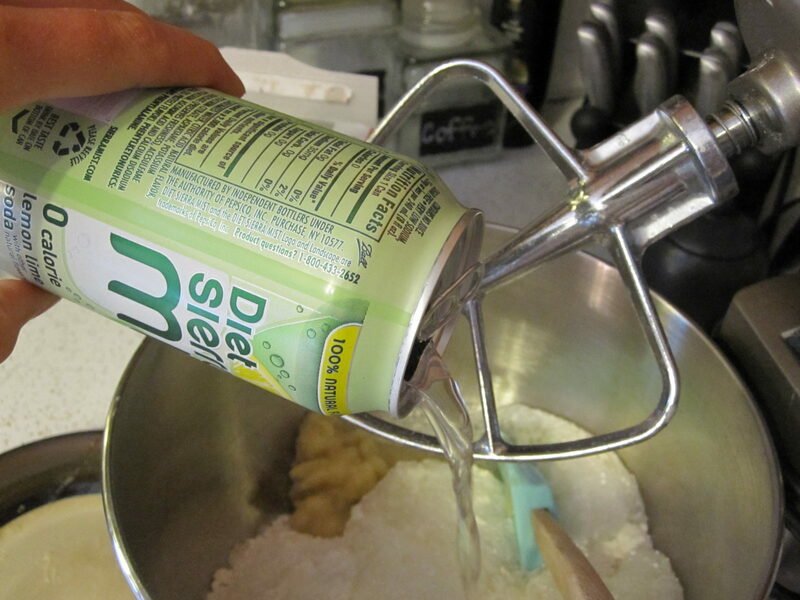 So I was wondering if you could use this soda method for other boxed baked goods? Because I have this box of cookie brownies that I have been meaning to use.